As Jed on the “Beverly Hillbillies” liked to say, “Well, Doggie!” I’ve done figured me out a way to be a best-selling author! I am reading Annie Seaton’s best-seller, “Promotional Tips and Tricks for Aspiring Writers in a Digital Landscape.” Great advice, but I believe I accidentally discovered my own way to fame today. It involves a dog. Perhaps any dog would do, but our dog happens to be a sable and white rough collie like the dog of “Lassie” movies and TV shows. My first Christian mystery-romance-suspense, “Bridge to Nowhere,” doesn’t have a dog as one of the main characters. My mistake. The third “Bridge” book has a borrowed collie that plays an important role in the book. But by book four, five and six—I have it made! I hit the jackpot! All of them have a dog as a main character. Now, here’s how I know that will sell books. The car was still in the garage today, or I might never have made this monumental discovery! The freezer was empty and the refrigerator was bare because we’ve been without a car for over a week. Then we ran out of Diet Coke and chocolate. That’s when we declared a state of emergency. We snapped the leash on the dog and hoofed it up to the store. It started snowing. Hard. By the time we had walked a mile in the snow, we were plastered with snow. All three of us. Alan shook off the best, so he went into the store to get the emergency supplies. I stayed outside with Angel Joy. Now, remember…I was plastered with snow. My green coat was white. My blue wooly hat was white. I could barely see for the wind-whipped snow darting around in front of my eyes. 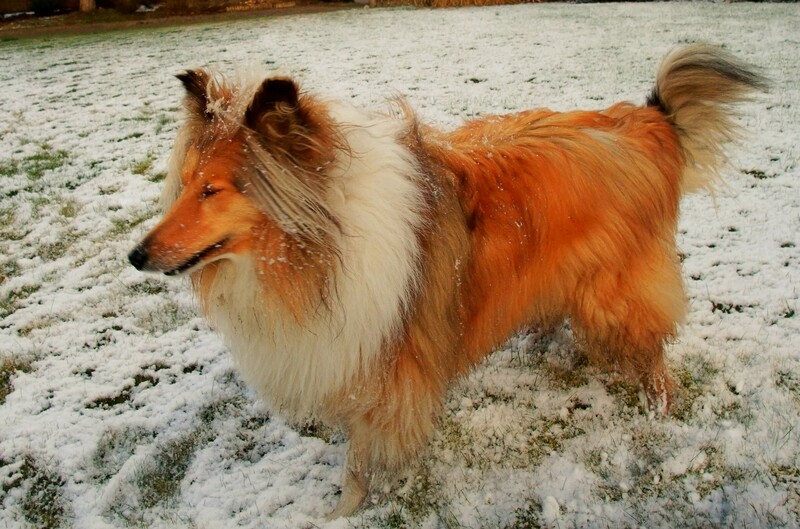 But Angel Joy was also plastered with white and only a few patches of honey-brown fur showed through the snow. That’s when I figured it out. Most folks like dogs. Most folks like collies. Annie Seaton talks about building your own “brand” as a book promotional tool. Being from Bandera, Texas, brands are one thing I understand. I already have my own brand for book signings: Texas Flag boots and shirt and a western skirt. But now I know how to brand my books. I’m a’fixin’ to collie them in! Posted on March 10, 2013 by authorstephanieparkermckean •	This entry was posted in Uncategorized. Bookmark the permalink.